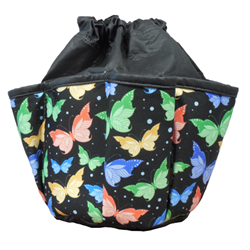 Always a classy pattern, this butterfly bag comes with 10 pockets around the exterior. The dauber bag features two drawstrings to open and close the bag as well as a complementary pouch. Made from a durable vinyl material, this bag will bring loads of fun to your bingo game.